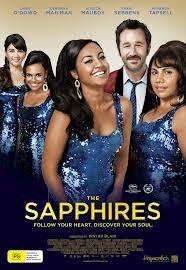 Two weeks ago we went to a premiere of the movie “The Sapphires” here in Winnipeg. It’s one of the perks we get from being on the Winnipeg Film Festival team. I had seen the trailer, but otherwise hadn’t had time to research or to read up on this movie. I just trusted our leader to bring us to a good movie! And this movie (or the leader) did not disappoint! What a beautiful story about love and success, inspired by true events. Four aboriginal Australian girls are formed into a singing group that ends up going to Vietnam to entertain the American troops. The lines are amazing, the humor’s great, all the way to the end. And if you like harmony, there are at least a few songs you will like. They start out with country and western songs like “Today I Started Loving You Again” (by the way, a very beautiful song!) and move on to soul songs. And they did warm my soul with their songs and their story. I could especially identify with Gail (played by Deborah Mailman), the oldest and most outspoken one in the group. She seemed to be the naturally born leader, always the responsible one in the group, feisty when it came to fight for the group. I liked to see the transformation of her character. She plays her role brilliantly. Her relationship with the group’s manager David Lovelace (played by Chris O’Dowd) is such a great picture of real life. Here are two people just trying to survive, both with a past they cannot shake, their first meeting real awkward. But they connect and fall in love. Great, great story!